As soon as I saw the Mini Sewing Room Die, I knew I had to use it! I fell in love with the original Sewing Room. I used it so much for so many projects and tags. Since this one is a “mover and shaper”, I used my Base Tray in my Vagabond Machine to die cut. This would be the PERFECT size die for the #5 Tags. I used the Wild Honey Distress Stain over it. For the background, I used my Vagabond Machine and Tim’s Texture Fade called Springtime Backgrounds and Borders. It’s my second favorite texture fade. After I embossed the images with the texture fade, I sponged it with Walnut Stain Distress Ink using my Ink Blending Tool. I took some Canyon Brown Cardstock to cut the form and the spool. 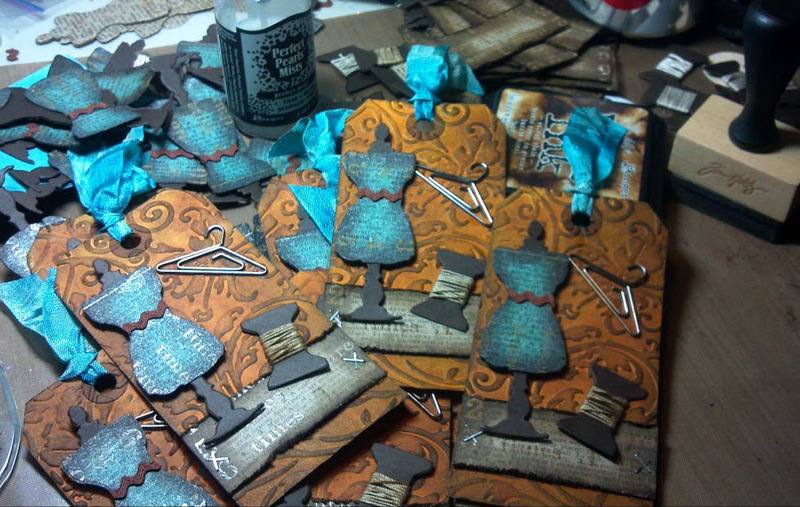 I also took some yummy Tim Holtz Kraft Resist paper and cut out the bodice of the dress form. (this is the same paper I used for the little border strip towards the bottom of the tag) I used the Broken China Distress Stain over the Kraft Resist and then sponged it with Walnut Stain Distress Ink. I then added Perfect Pearl Mist – Perfect Pearl to the Bodice before attaching it with to the Brown Dress Form. The paper strip is the Kraft Resist Paper sponged with Walnut Stain and then distressed with one of my favorite tools… the paper distresser. Then I attached it to the tag with the Tiny Attacher (another favorite tool). For the ribbon, I toolk the Broken China Distress Stain and went over the trimmings. And then added the hanger clips with the multi-medium. Yeaaa! It’s so good to see you creating! I miss you Joyous! Gorgeous! Thanks for the inspiration. 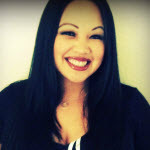 Joy…..your tags look amazing! LOVE what you created! Miss you. Gorgeous, Joy! Love the blue and brownish gold color combo. I need that mini dress form!! “HAPPY” to see that you’re slowly getting out of your shell, very proud of you! Yey ,,,, joy got talent. LOVE LOVE LOVE it Joy…..So Pretty! Great color combination!!! Still loving your Halloween tag that was included in my last order!!! these are so pretty, Joy! fab work! thank you very much Joy!!!! it is a beautiful tag and now i think i may need to order it for myself! AMAZING! Totally love the color combo! I got one of these with my order. I just love it! Thanks!!!! Hey Joy, Just received my recent purchase from Emporium and was so excited when I saw the tag. I am a dress form girl so I thrilled. Saw your name on the back of the tag, looked you up and there were the instructions! Loved my purchase but loved the tag almost as much. Thank you! Thank you for your share with us such a good article. This is an impressive blog. I will continue to read your article, very thank you for taking the time to submit. I want to share it! Read a good article is like a journey, we could see the beautiful scenery. And enjoy the feeling.Give us a new understanding of this article. Thank you very much for you! http://www.ralphlaurenonlinepolooutlet.com/ Tämä päivä on mennyt oikestaan koko päivä ratin takana, eli joo on riittänyt kuskattavaa. masentaa toisaalta oon tottunut viettämään juhannuksen isän kans, mutta nyt ei niin ole. No ehkä kummallekkin vaihtelu piristää, no kyllä me suuniteltiin että mentäis käymään mökillä ens viikolla. Olisi taas vaihteeks kiva nähä isääki. Kummityttöki on jo iso! vastahan se synty ja nyt se on jo 1 vuotta! pitäs päättää 1 vuotis kuva itelle. Kyllähän se aika menee nopsaa! http://www.cheapbeatsbydrestudioutlet.com/ Maanantaina 25.6 olisi tatuointi aika!! vihdoin ja viimein, ajatuksena on siis ottaa oman koiran tassu ja siihen nimi sillein oikein hienosti. Se tullee olemaan itelle merkityksellinen tällä hetkellä omassa elämässä elämän mies on se koira voin tännekkin sitte laittaa kuvaa siitä jos halukkaita on näkemään! http://www.clarisonicoupon.com/ very much look forward to your more similar to the update, Really great post i will definitely come again to read something interesting next time. Wholesale cheap snapback caps with low discount online,buy ralph lauren polo in ralph lauren outlet online store. Welcome to Nike store to buy soft nike free run nike free run shoes to walk and run.If you love fashion shoes,just choose isabel marant outlet isabel marant outlet to buy what you like. Choose a beautiful christian louboutin sandals and a brand bags from Christian Louboutin Outlet shop to join a party. The dsquared shoes supply high quality sneakers,welcome. Buy Jordan Heels online with low discount,cheap ralph lauren polo supply in Polo Ralph Lauren Outlet shop. Enjoy shopping, safest and fastest. Fulfilling the Need for Good American Shows When was the last time you sat on your sofa to relax and laugh in front of your TV screen hoping for a good comedy series? Or do you recollect your last encounter with good adventure on your television sets? No, we are not hinting at the existence of some ridiculous Hindi drama in the name of comedy nor are we saluting the wannabe bikers in the name of adventure. We are talking about the less popular venture in the country called the American shows. But many channels in recent years have managed to pass the test of a good foreign channel and this is mainly because there is a huge demand in the market for English shows in India. What started once upon a time with FRIENDS, remained to be a trend provided the shows had some really good content to offer to their viewers! Similar is the case with Adventure shows. Adventure reality shows adapted from foreign countries and shows in the likes of Roadies fails to match the international standards in India. That is why most viewers go back to the original format of the show and fall in love with their execution. But that does not mean Indian reality shows have bad formats. Channels here are forced to cater their flavours to Indian standards if they want to make the show successful. That is why celebrities are roped in as hosts and their emotional act with the contestants plays an important factor in gaining viewership for the channel. But when it comes to English shows, at most times they act as a relief to the national audience here. American Comedy Series like the Big Bang Theory, How I met Your Mother, Two and a Half Men, Modern Family, 2 Broke Girls and New Girl proved to be the much needed comedy the television world really needed. Same goes with reality shows in the adventure genre. Shows like the Amazing Race, Fear Factor, the Hero, The American Ninja and more has managed to create a good format to keep their viewers happy. And that’s what has been the channel’s motive. Channels like AXN, Star World, Zee Cafe and similar channels have aggressively started promoting these shows, now that they see a huge demand in the market for them. Platforms like the channel online portals, social media platforms and popular banner spaces are being used like never before. That’s because catering to the online audiences is also important, since most of the viewership comes from online users. So, this and more being the real scope for the networks, will they continue to serve better shows to their viewers? Only time will tell! Author is an expert in writing articles about TV channels. Currently writing topics like American comedy series and adventure reality shows. Hello admin, i must say you have high quality posts here. Your page should go viral.